This entry was posted in Broadway, Celebrities, Uncategorized and tagged in the heights, lin-manuel miranda, Vanessa Nadal. Bookmark the permalink. I love everything about it (I’ve watched it three or four times) except the way the father of the bride pronounces L’chaim. Gee, I was really hoping for a salsa version of La Hayam. Or an appearance by Salma La Hayek? Regardless, l’chaim to them all. Gotta love us quirky Theater folk! Its good to see that, even among those at the pinnicle of their craft, they haven’t lost the joy of a little theater tongue -in-cheek cheesiness! Now, that’s a wedding moment to remember! 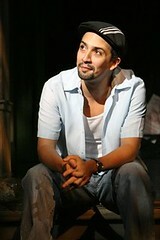 If only “in the heights” was this good! This reminds me of Darby Ballard and Doug Truelsen’s wedding. Loved it! Weddings are supposed to be a celebration and this was truly a wonderful gift to the bride and the guests!